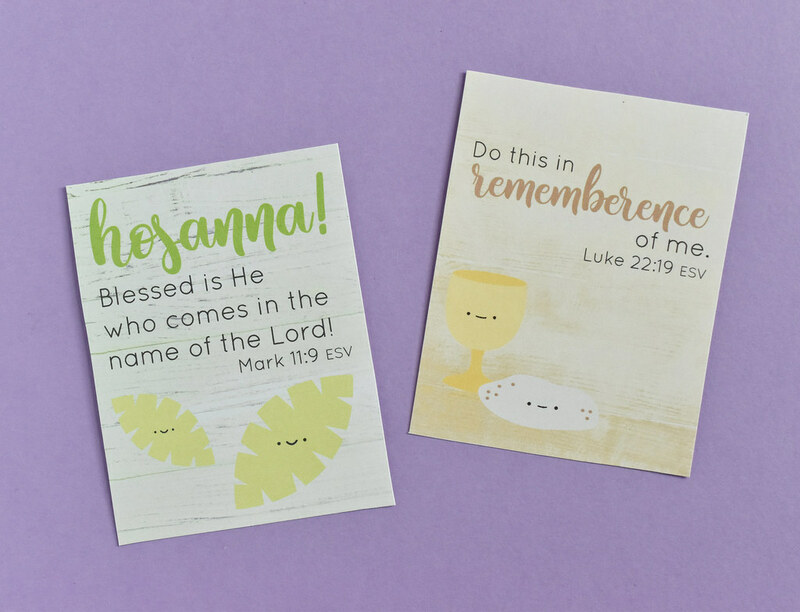 It's almost Holy Week, and I like to find my own Wild Olive ways of remebering, observing, and celebrating the most important week in history. 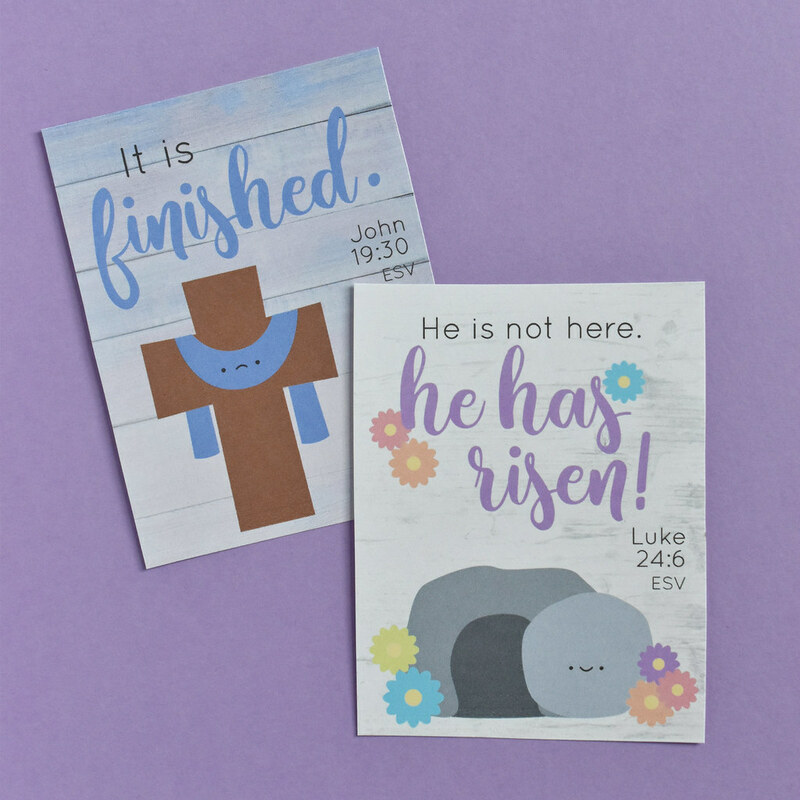 This year I'm sharing these printble verse cards with you. 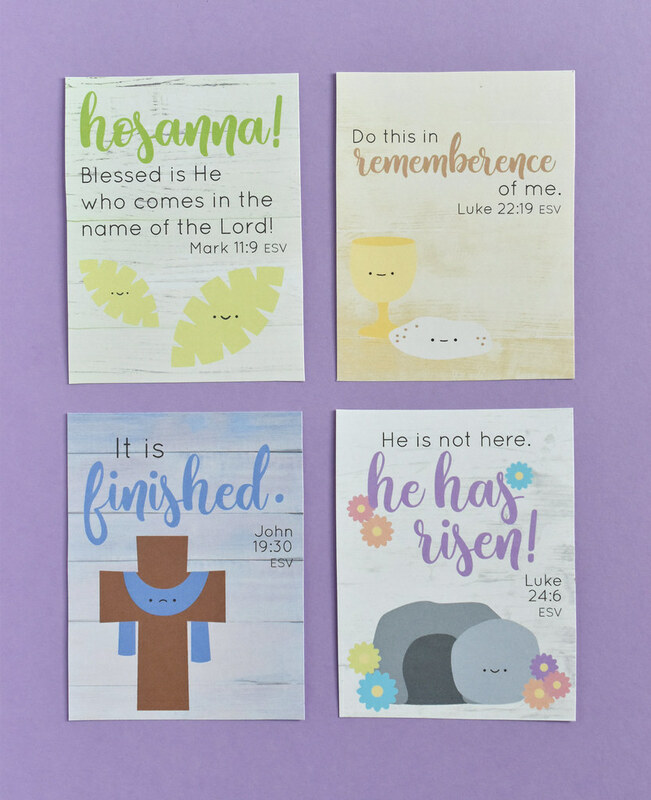 The artwork is based on the Holy Week felt garland I made a few years ago. 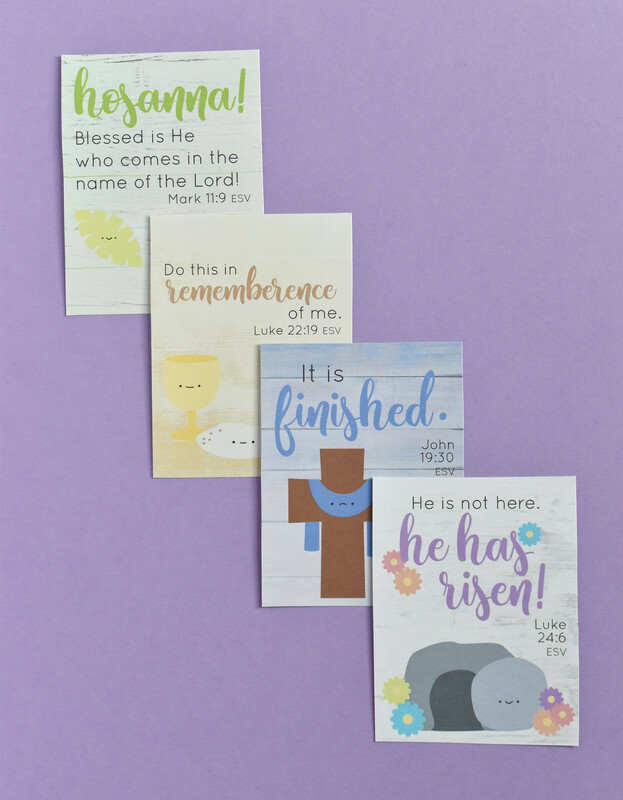 These cards are a great way to learn a few verses from this week in Jesus' life, to mark these sections of your Bible, set around in your home to see Scripture daily, or even to add in to your Bible journaling. 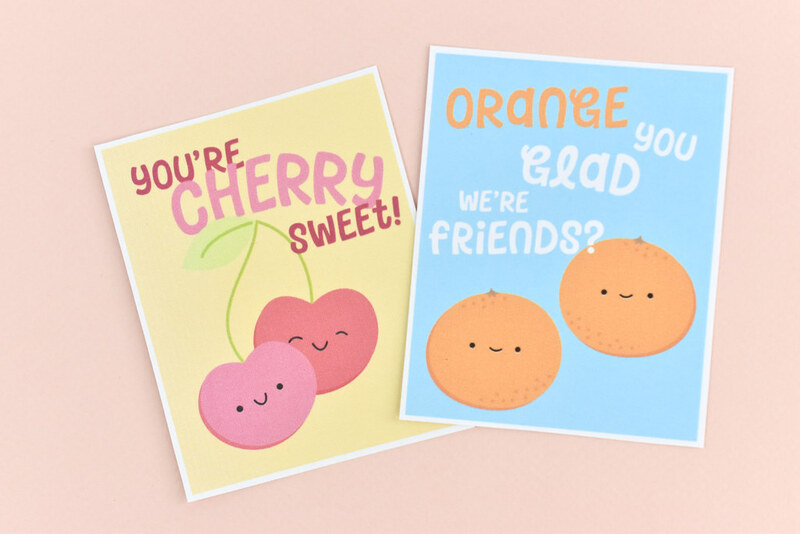 All you need is some card stock and a pair of scissors. 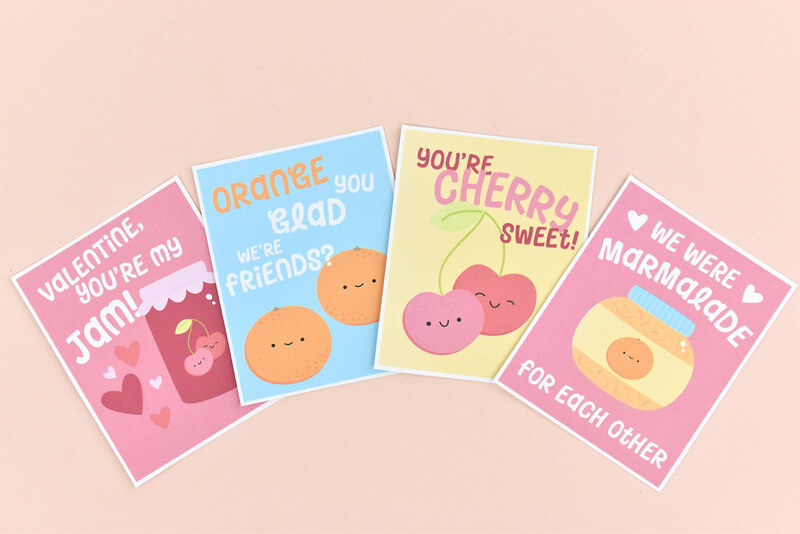 I recommend printing the cards at the highest quality setting on your printer. 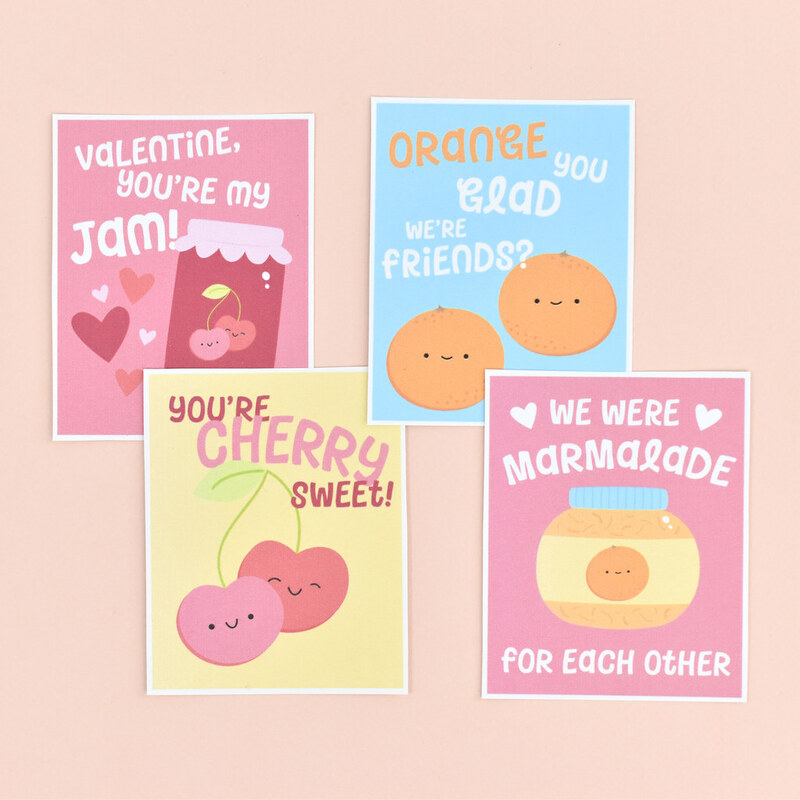 You can also send this to an office supply print shop. While I ask that you not use these commercially, I do love it when people share my work. Feel free to print as many as you want to give away, whether to a friend or your entire church. 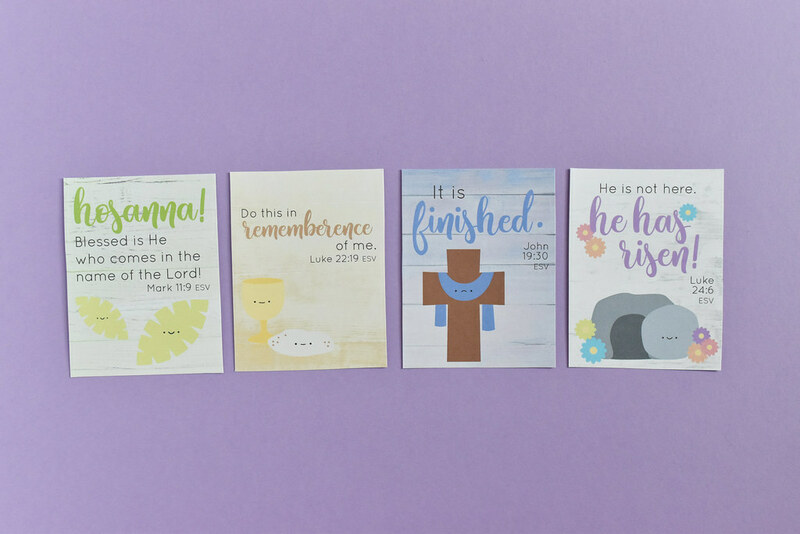 For the cards, I could have chosen a lot more verses and icons to go with them. 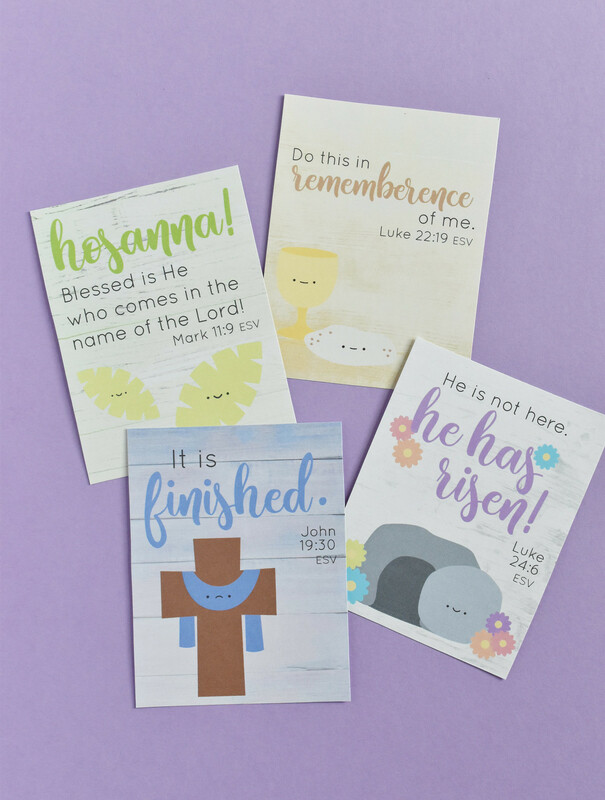 But I went with Palm Sunday, the Last Supper, Good Friday, and Easter Sunday. I'll also be sharing these on Instagram (I'm @molliejohanson there) on these key days, with some reflections. Allow me to be candid. Sometimes I question whether I should put face on these objects that we connect with things that are holy. 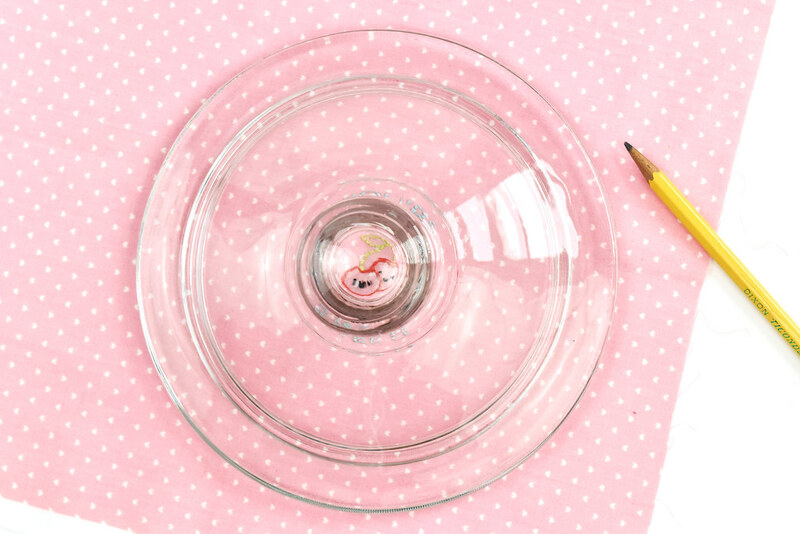 Like, do I cross a line by making communion cute? But here's the thing: my faith — my relationship with Jesus — is in every part of me. Or at least that's my hope! And making things cute is part of me, so why wouldn't I make these kawaii faith icons? "So here’s what I want you to do, God helping you: Take your everyday, ordinary life—your sleeping, eating, going-to-work (for me, that means drawing cute things), and walking-around life—and place it before God as an offering. Embracing what God does for you is the best thing you can do for him." May your Holy Week and your everyday ordinary life be filled with good things and God things! 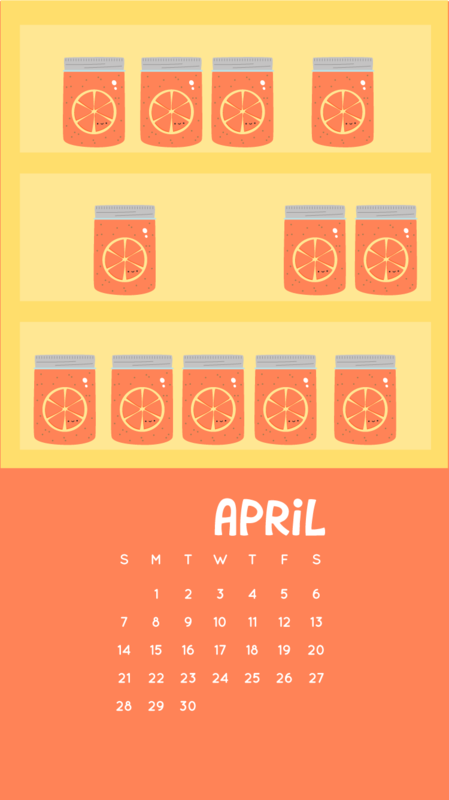 I was tempted to post this new April calendar wallpaper and pretend like I had posted it on time, but that you just stumbled upon it late. But I'm too honest for that. I'll gladly own up to falling behind again. Still? Yep. That's just how it is. 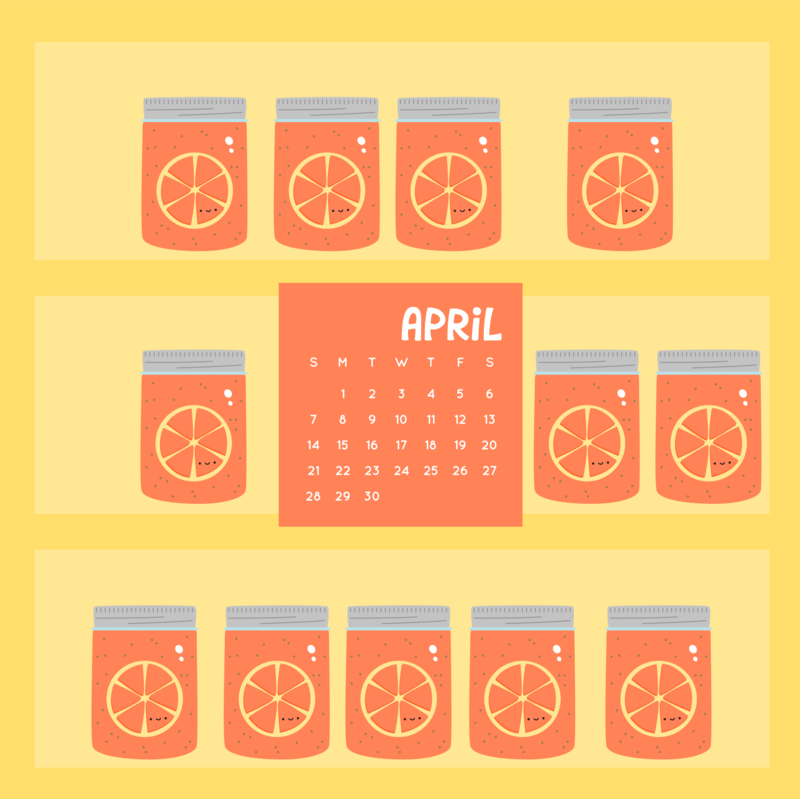 And so, we flip the calendar page a few days after the first of the month. It's not finished yet. I still have empty shelves and TONS of stuff to go through. But it's a happy place right now and I'm looking forward to making it even better. But now it's time to get back to making jam. 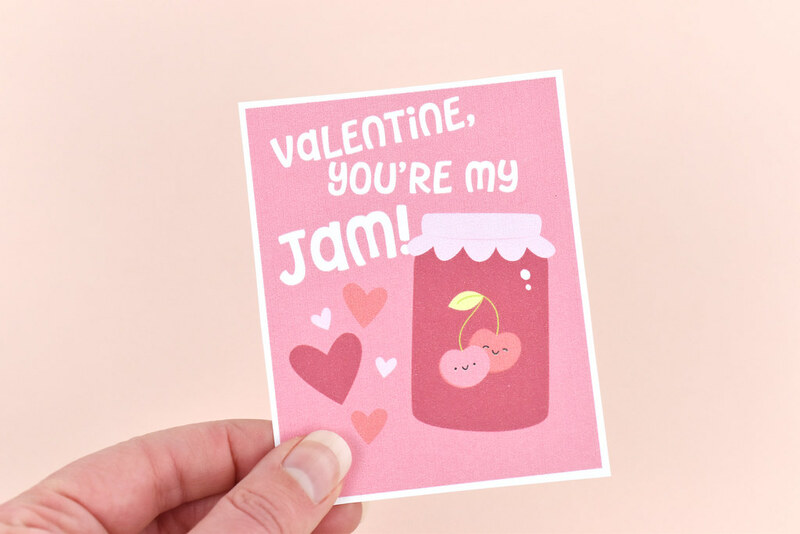 And today, I've got some pink grapefruit jam! I will admit that I chose this flavor for it's color. Because isn't it yummy? I also found a recipe that inspired the look of my jam. It's Pink Grapefruit and Vanilla Bean Jam (hence the little specks in the jar). I'm drawing the embroidery pattern right away and stitching as soon as possible this time. 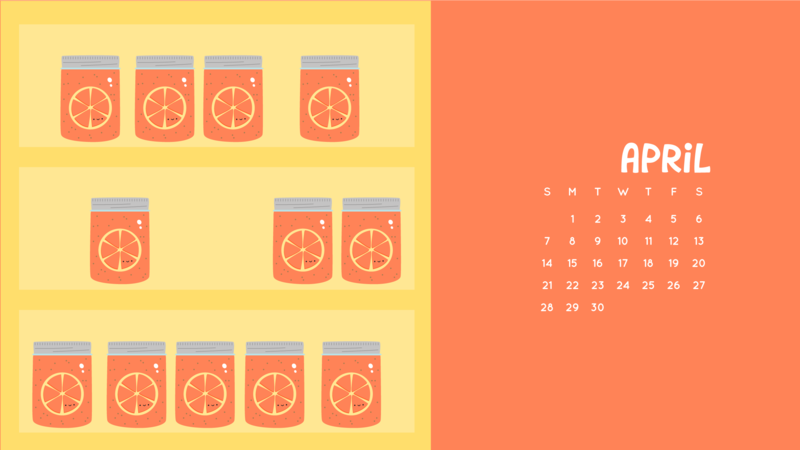 But for now, even though it's a little late, grab a calendar wallpaper for your computer, phone, or tablet. Good things come to those who wait, and in this case, the good is not one, but TWO patterns! 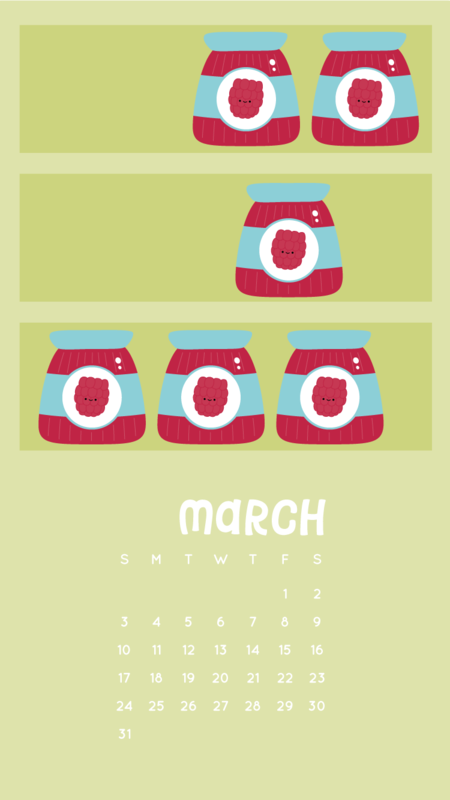 To continue the Jam of the Month Club for cross stitch fans, today I'm sharing a jar of raspberry jam. 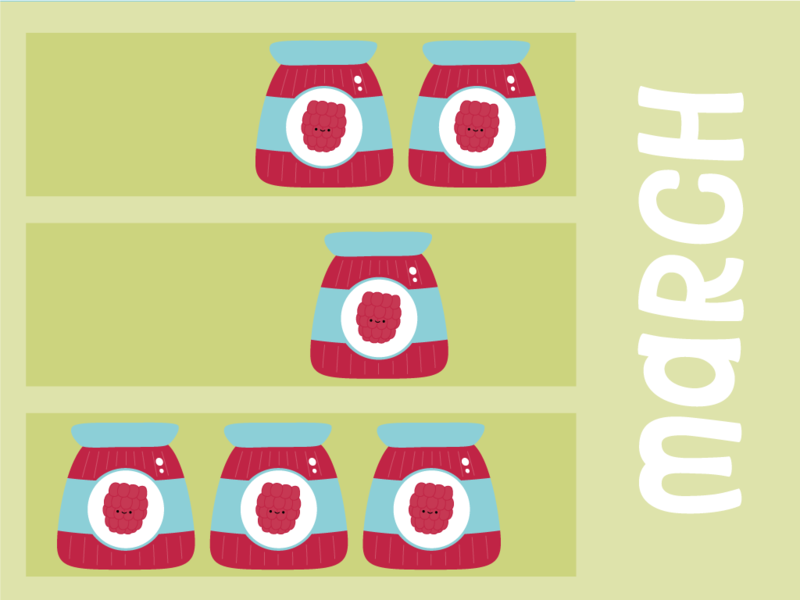 But not only that, I have a chart for if you want to make a giant shelf unit for all your jam jars. This large chart is kind of like the embroidery and english paper piecing idea. Instead of making a quilt that looks like shelves, you get to stitch them all. And since the shelves are all ready as a chart, you can get started on them, even as you wait for each months' pattern. The individual jam patterns will all fit, sitting on the shelf and centered within a 30x30 block. The overall size of the shelves is a little under 8x12 inches when stitched on 14-count aida cloth. 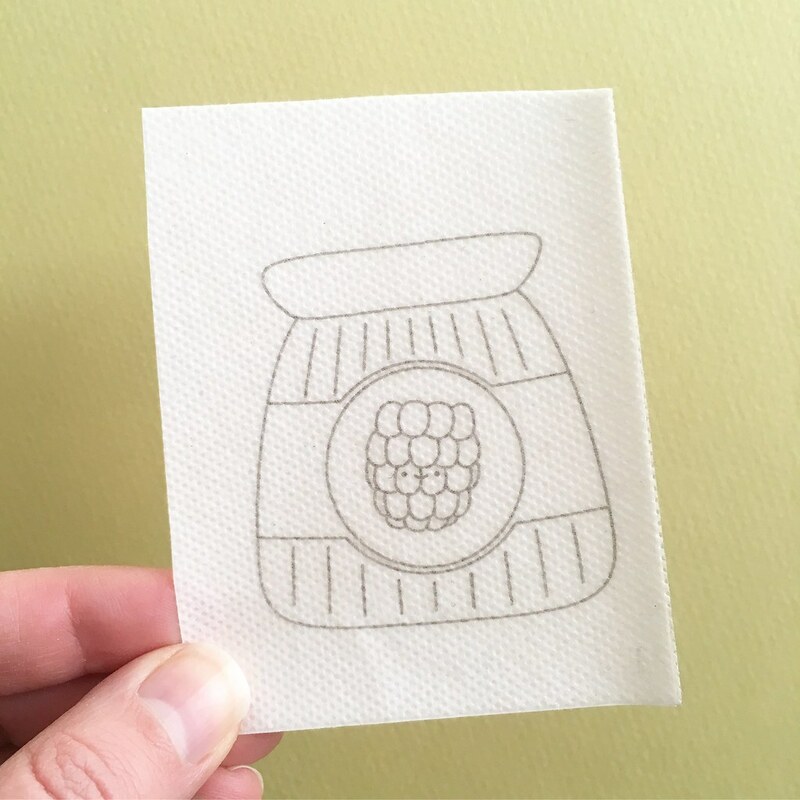 If you stitch these or any of the embroidery patterns, be sure to tag them #wildolivestitchingclub so others can see, and tag me @molliejohanson so I can reshare too! 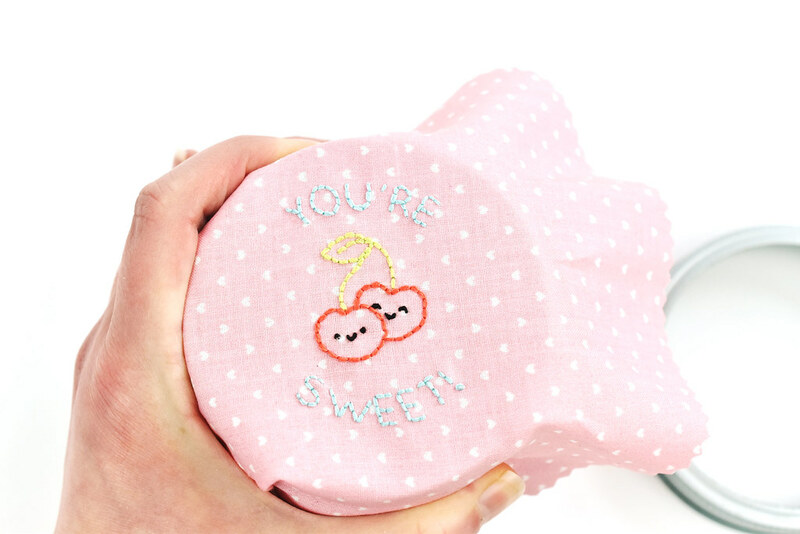 It's March 19, I'm posting this month's free Jam of the Month embroidery pattern, and I feel like I'm right on schedule. You may question me on that, but hear me out. I'm pretty sure it was right about this time last year that I was not getting the pattern actually stitched, but I was posting it anyway. And that's where I am today. In an effort to keep all the rest of my work plates spinning, I had to let a few things drop. 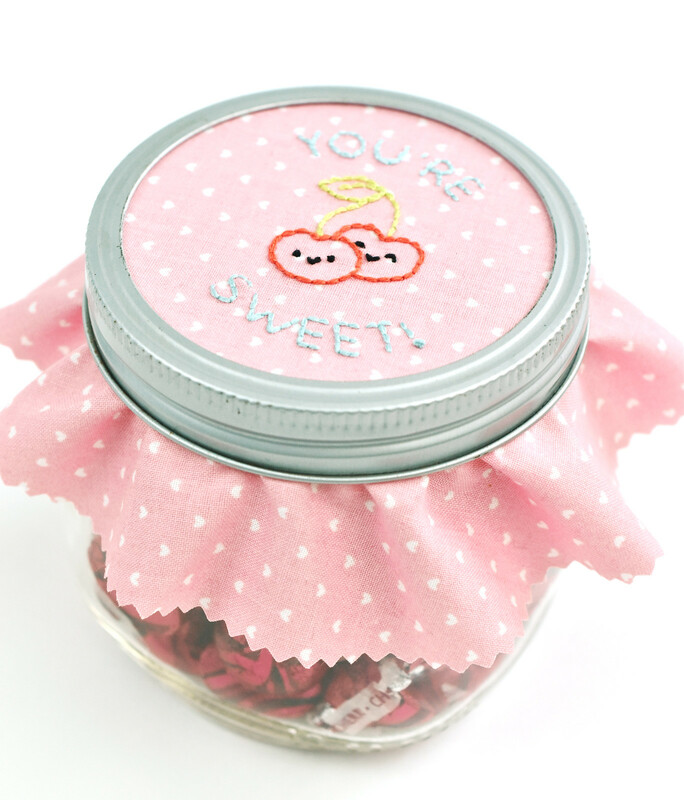 Stitching a raspberry jam jar was one of those. With any luck, I'll catch up on my own stitching soon. But lest I hold anyone else back, I present to you, this month's pattern! 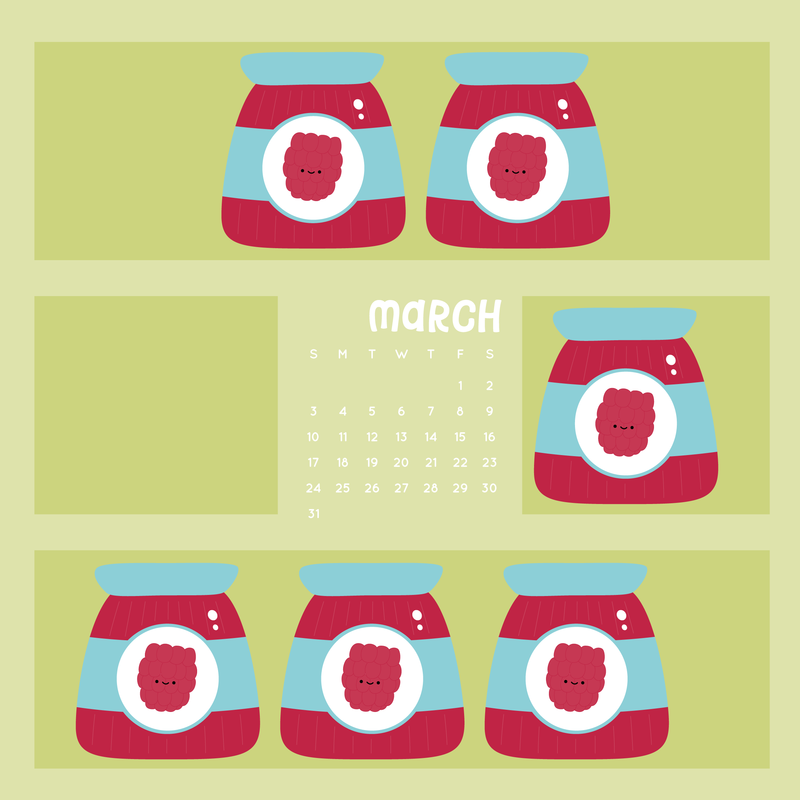 It's time to march into a new month with a new jar full of jam! Raspberry jam to be precise. 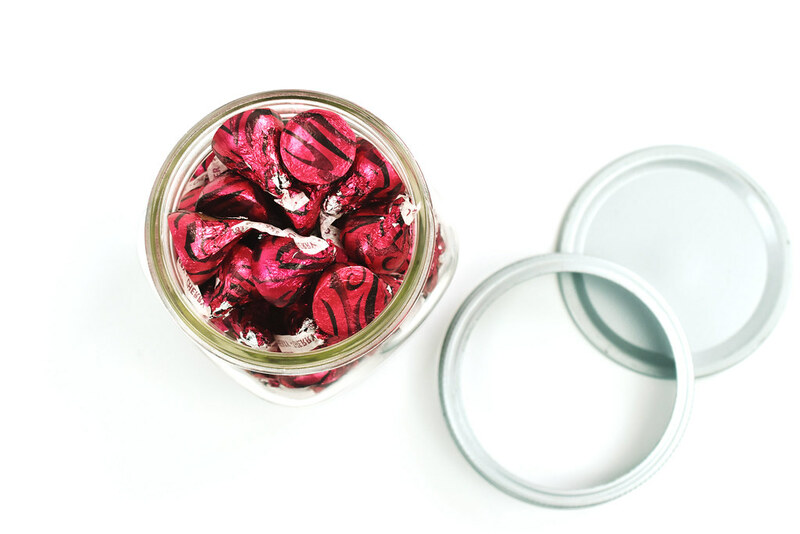 Yes, shelves of raspberry jam on wallpapers for your screns! These are some of the challenges of planning out a year of illustrated (and eventually stitched!) 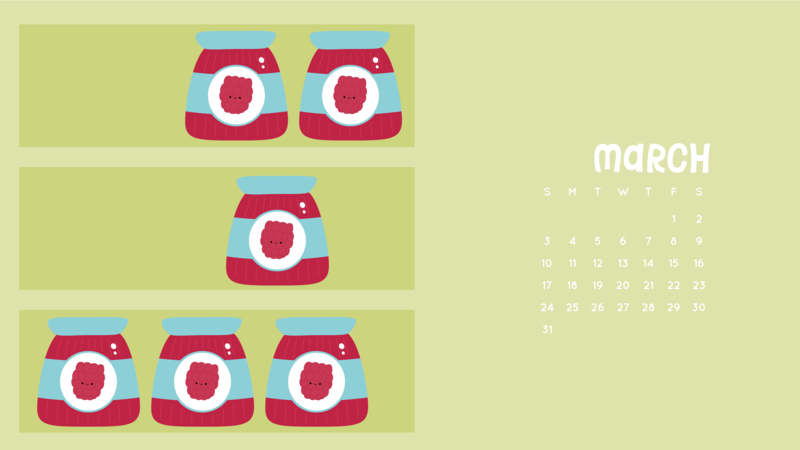 jars of jam. The real point here, though, is to get you some calendar wallpapers for your computer, phone, or tablet. Grab what you need and enjoy! By the way, raspberry jam is one of my favorites. Like, I could very happily eat it with a spoon. How about you? 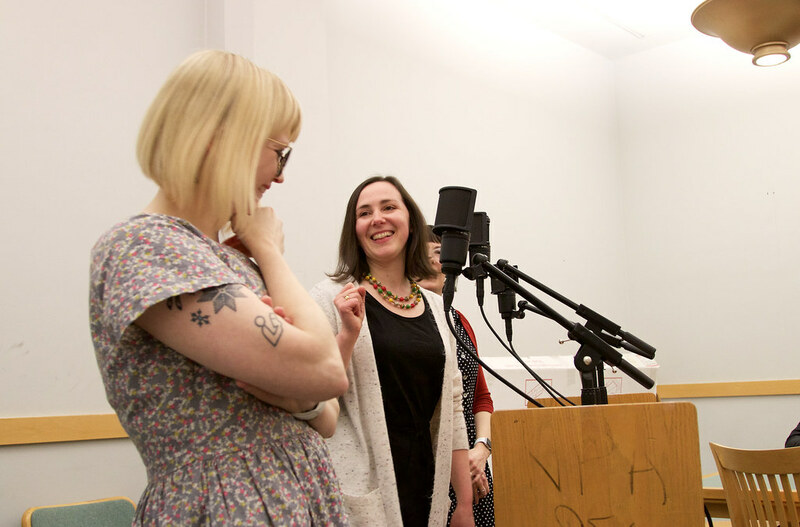 About a month ago, for the very first time, Heidi of Hands Occupied, Haley of Red-Handled Scissors, and I met up in the same place at the same time. 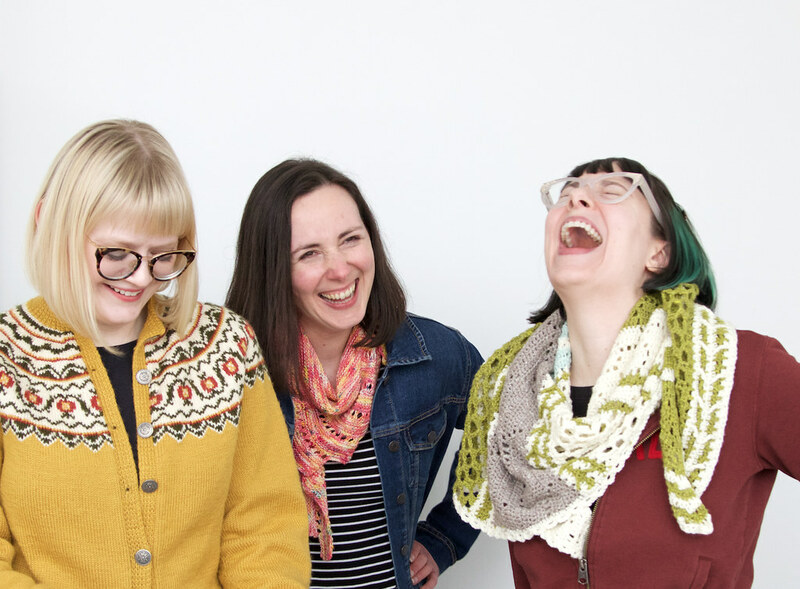 We record the Very Serious Crafts Podcast together, but we're usually in our separate homes in separate cities. 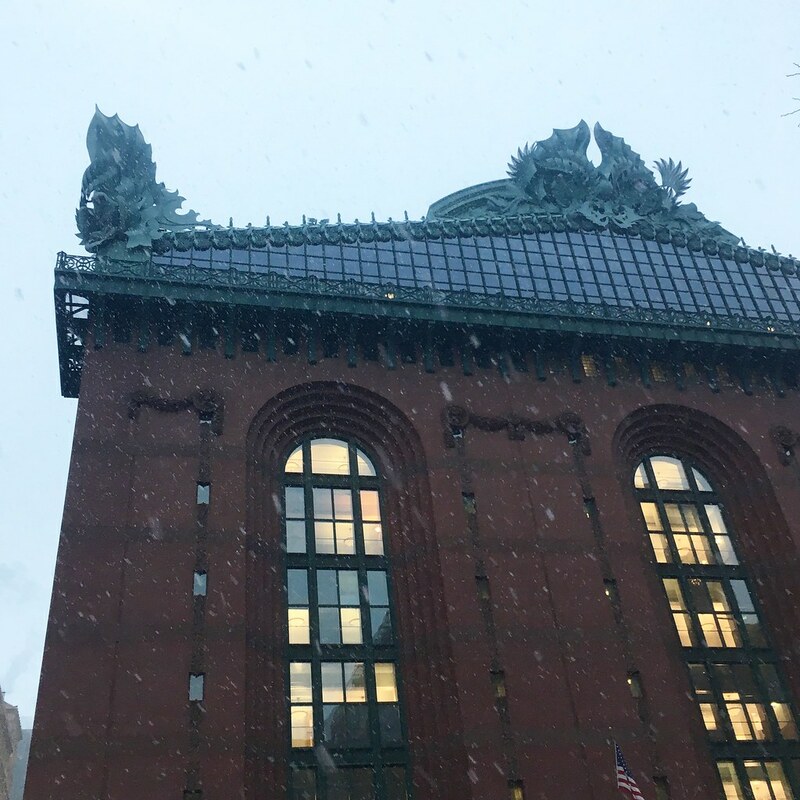 But on this occasion, we got to hang out and then head to the Harold Washington Library in Chicago. 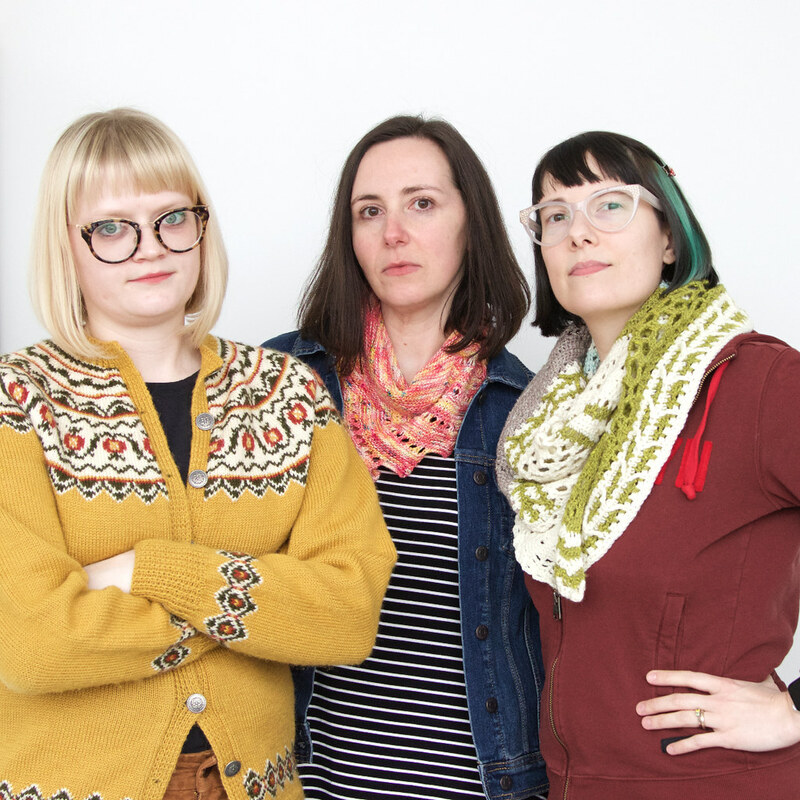 We recorded Season 2, Episode 4 of the Very Serious Crafts Podcast with a live audience and it was so fun! Okay, so the truth is that in addition to it being fun, it was also a little scary and awkward at times. This is what happens when you work at home with minimal real human contact. Haha! 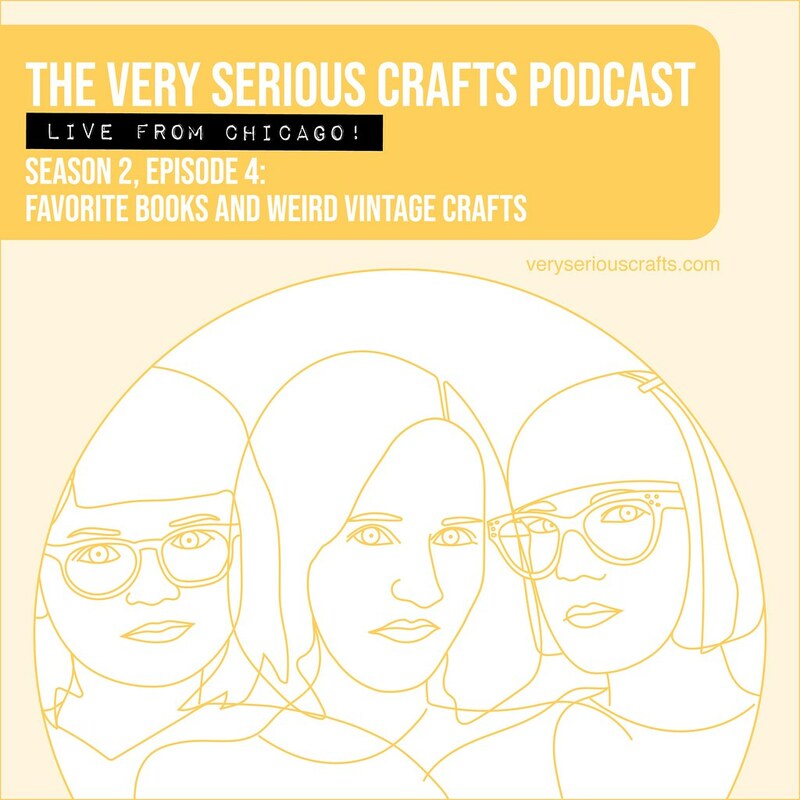 But anyway, if you'd like to listen to this live recording, it's available to download now at VerySeriousCrafts.com or on your favorite Podcast app. Be sure to check the show notes too, so you can see the resources and fun vintage items we shared. After the recording stopped, that wasn't the end of our day. Nope! 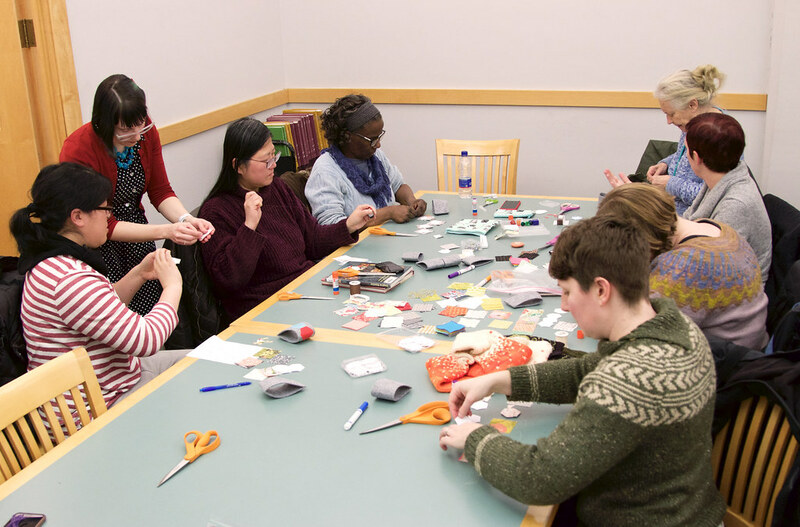 The second half of the program we hosted was a crafty make and take! Our project was a felt coffee cuff, embellishing them with three different techniques. 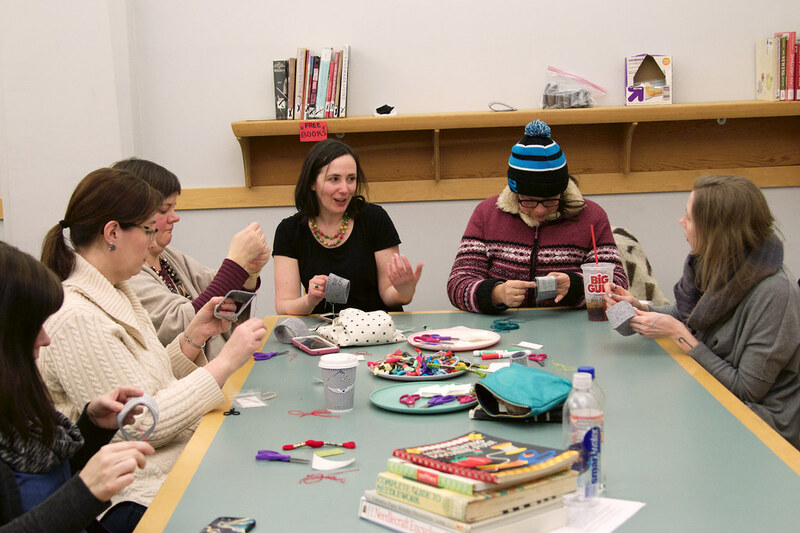 I worked with folks on embroidery, Heidi demonstrated latch hook (yes, on a coffee cuff! 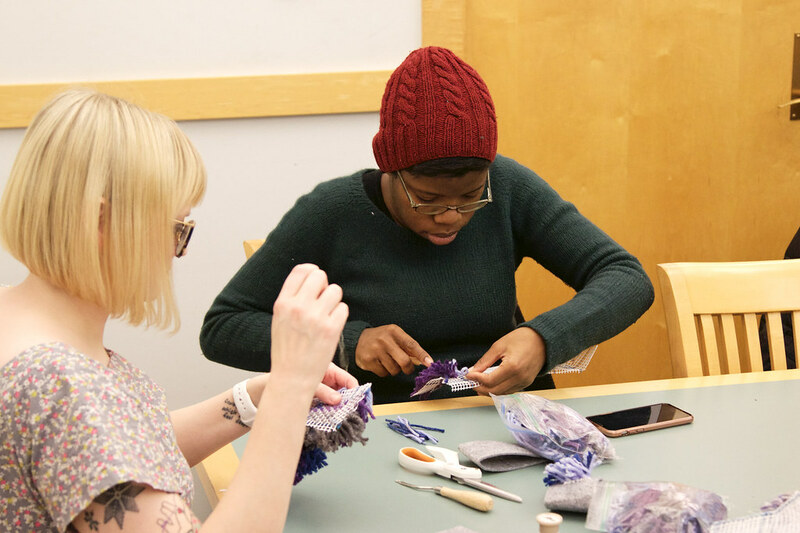 ), and Haley showed how to add English paper piecing. I started with just the Serious Crafter text and the little border. In fact, I brought in Serious Crafter patterns for everyone! But then I decided to add some flowers. And I'm still adding them, filling in a rainbow of simple lazy daisies. 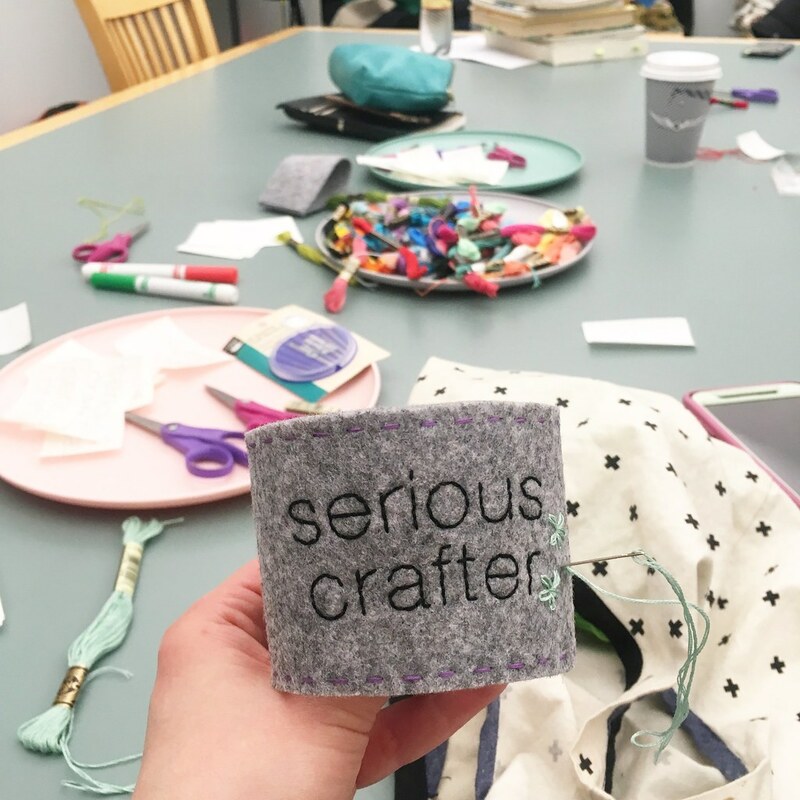 And I thought, maybe you'd like to make a Serious Crafter coffee cuff, or at least an embroidered patch of some kind! To make the cuff, cut the template shape out of thick felt. Fold the ends together and sew straight across. 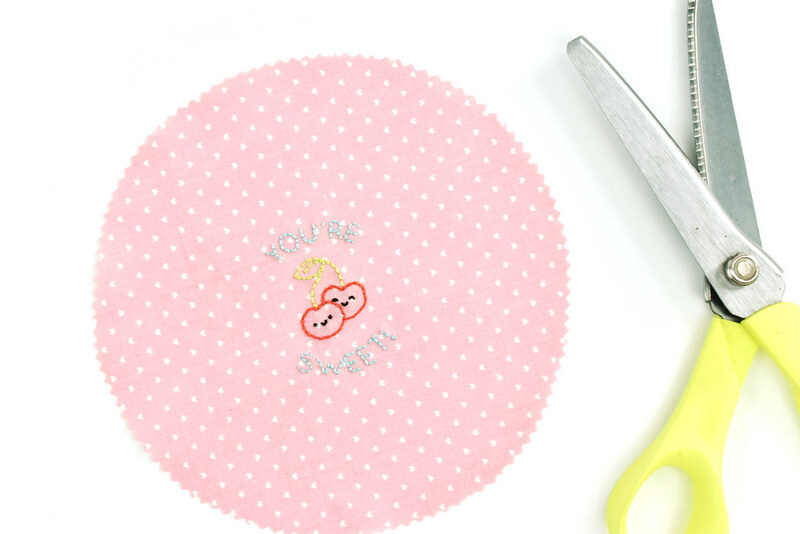 Print or trace the Serious Crafter pattern onto Sulky Sticky Fabri-Solvy. 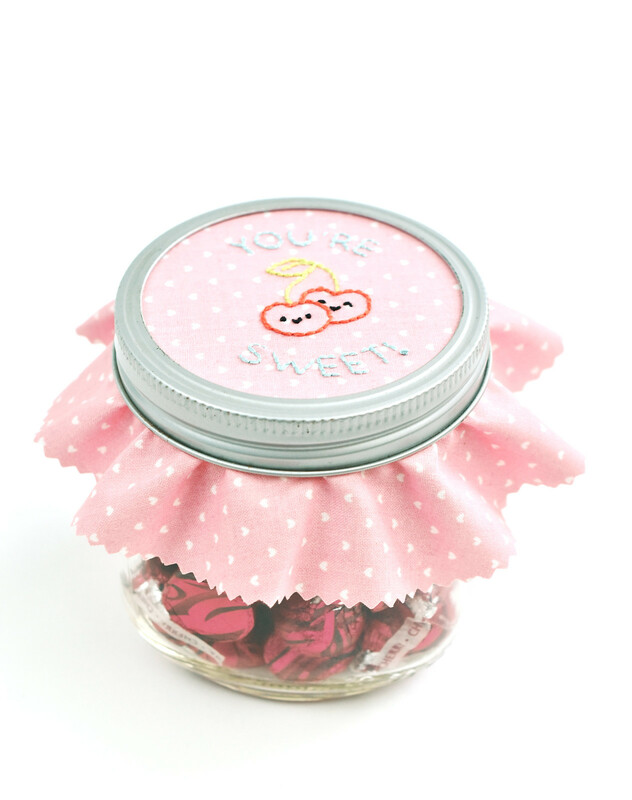 You can also use tracing paper for this, then tear it away after. Embroider through the felt and pattern. I used three strands of embroidery floss throughout the design. When securing the thread on the back of the felt, you should be able to turn it partially inside out to make it easier to work. When you're finished, soak away the Fabri-Solvy and let the cuff dry. 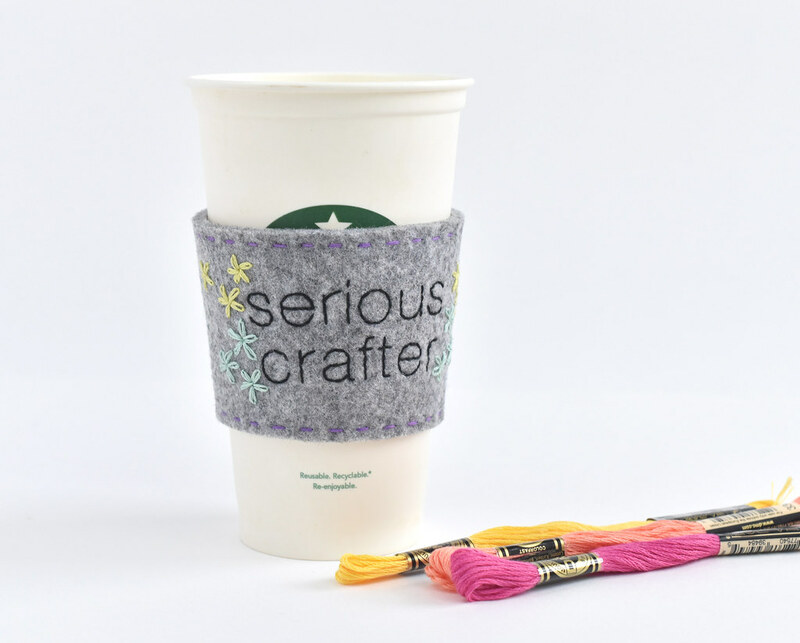 Now you can let the world know that you're a very serious crafter just like us! I mean, we're mostly very serious. Note: The coffee cuff pattern is based on a Martha Stewart pattern with some slight adjustments. 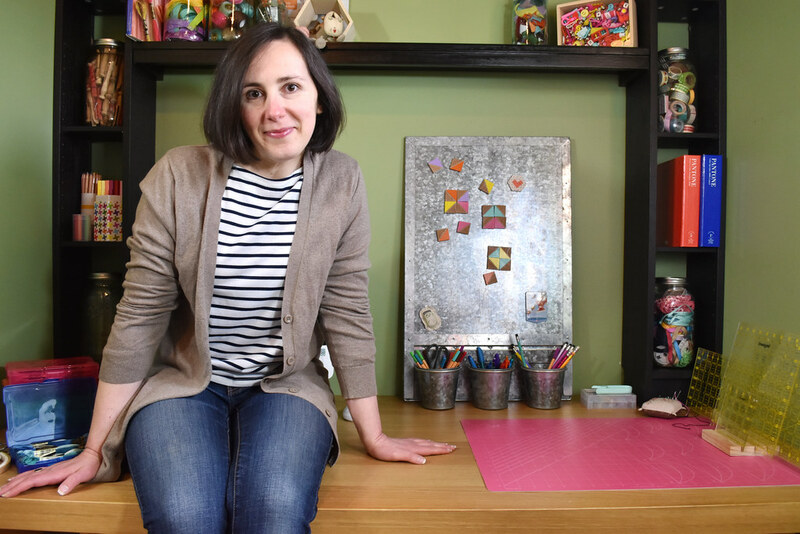 All photos (except the pic of the library and my coffee cuff pics) were taken by Heidi Gustad and her sweet husband! 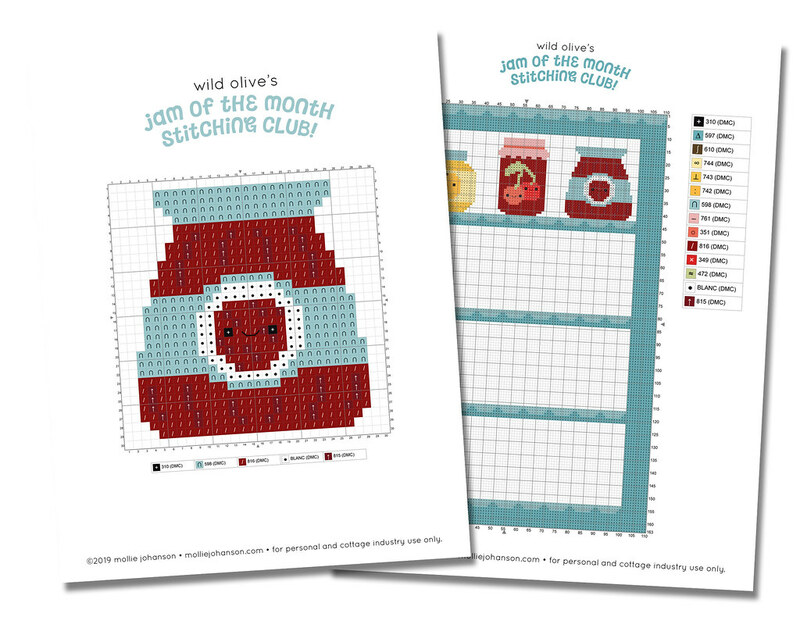 Are you ready for more Jam of the Month Club stitching? 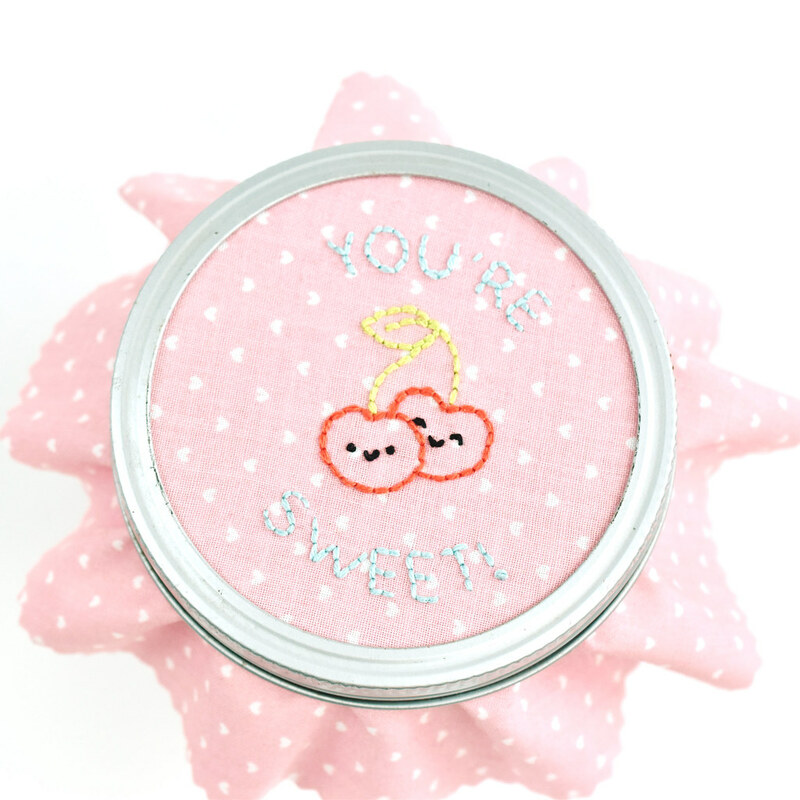 Becuase it's time for the Cherry Preserves embroidery pattern! 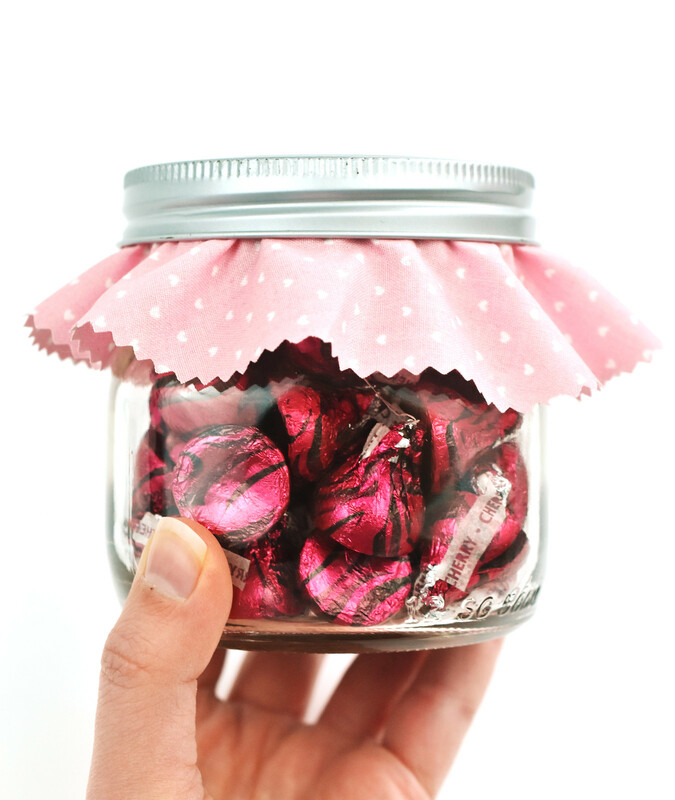 This little jar has the same cherries that were on the jar cover that I shared, and you may notice that the ruffled top looks a little familiar too. Do I have a pattern of a project or a project of a pattern? It's probably both. 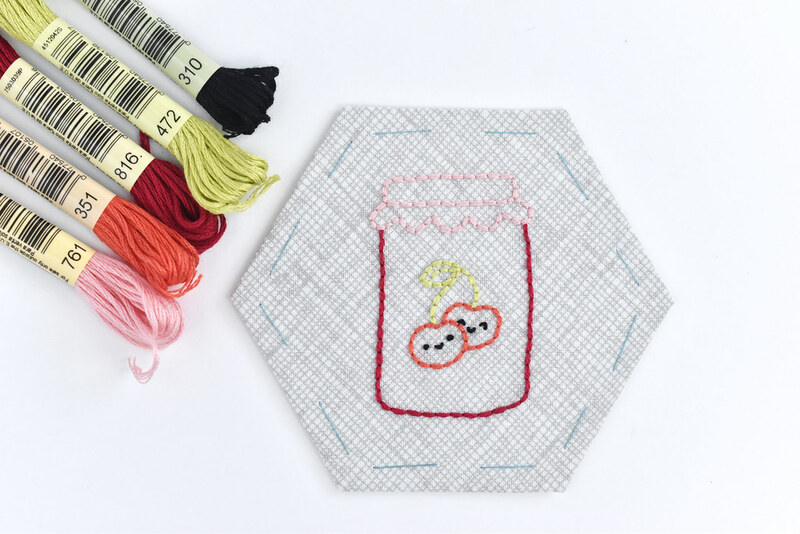 As a reminder, all these jam jars are designed to fit on 2-inch hexagons to make a mini quilt. But you can use them on their own too! Also, I'm just gonna be up front and say that the scale of these jars to each other might be a little strange along the way. Hopefully nothing too terrible! If you're a cross stitcher, I shared the first two matching charts the other day, but I have an update for you. I mentioned that they would look great stitched as one large design with stitched shelves. 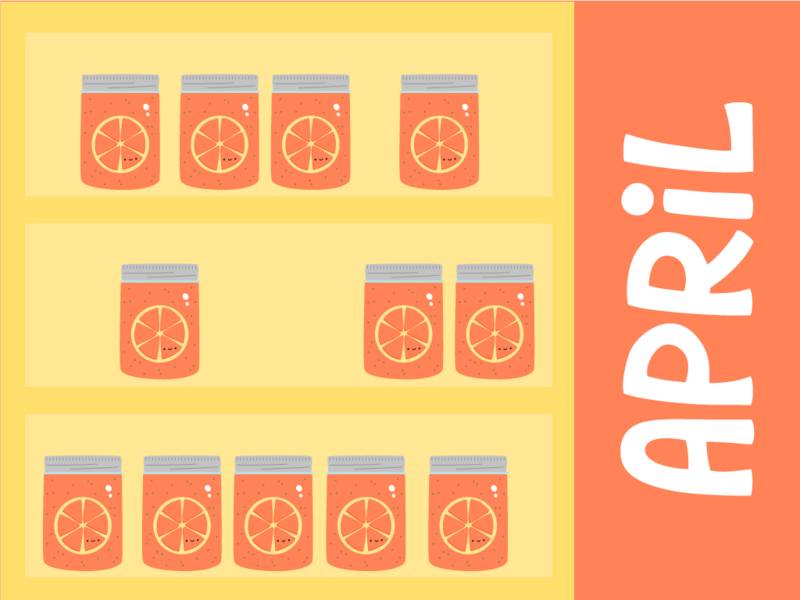 More than one person said they wanted to do this, so I'm going to make that shelf chart so you can work on that and add in the little jars one by one. Sorry to delay the start of stitching for that! But it will come soon, and I think we'll all be happier. If you like the kawaii Wild Olive style, but you do cross stitch instead of embroidery, I'm here for you! 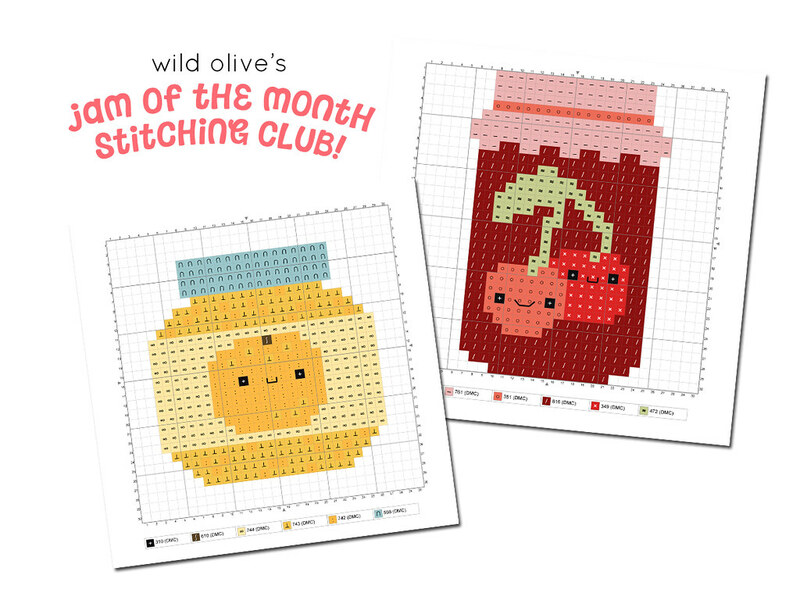 Today I have two free counted cross stitch Jam of the Month Club patterns! A few years back Cross Stitch Crazy Magazine asked me to design some cross stitch charts for them, and my first response was "you know I design embroidery right?" They said if I'd be willing to try designing for cross stitch, they still wanted to work with me. Fast forward a few years and I've now contributed to the magazine a few times a year, and I love working in this different (but similar) medium. So when someone asked if there might be Jam of the Month cross stitch patterns, I couldn't resist! 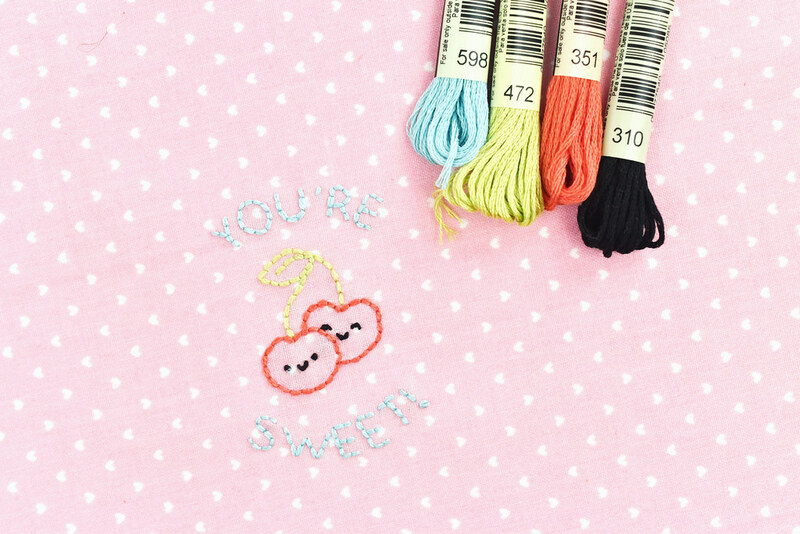 I'm a crazy slow cross stitcher, so these ones you only get in chart form. I was also apparently slow on even getting the first pattern finished, so you TWO this month. Hooray! 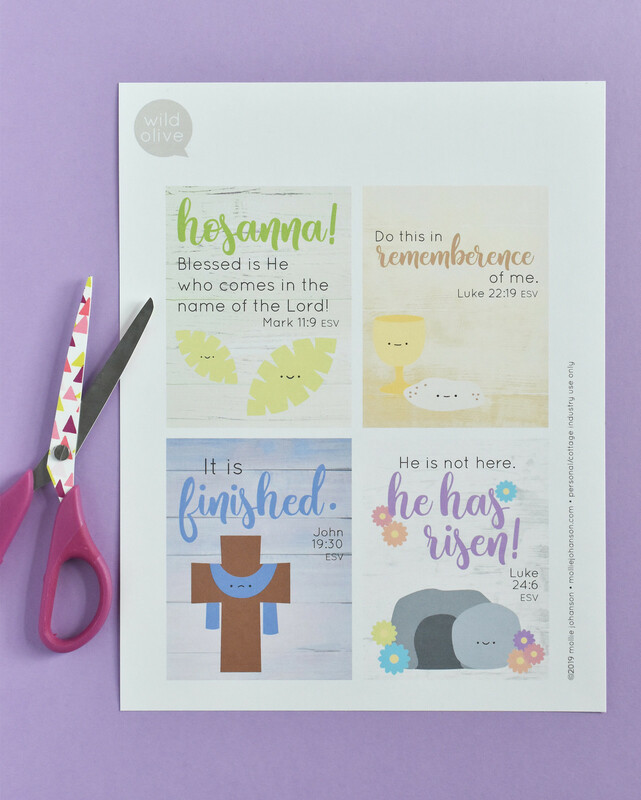 I've never incorporated cross stitch into english paper piecing, but in theory, you could use these with the mini quilt project. But I think these would also be cute as one large cross stitch with stitched "shelves". 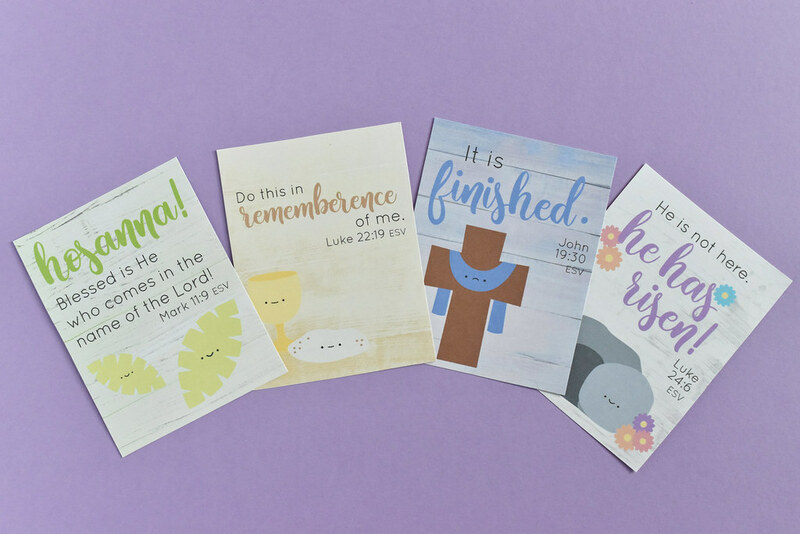 OR, work them up individually, frame them in hoops, and hang them in your kitchen! UPDATE: A large chart with shelves is coming soon! No matter how you use these, I'd love to see your stitching. Tag your pics with #wildolivestitchingclub on Instagram!